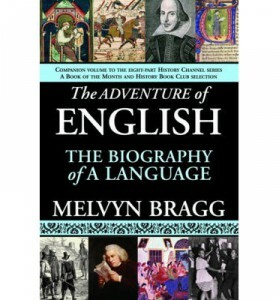 The Adventure of English was a British television series on the history of the English language presented by Melvyn Bragg and which was released in DVD format in June 2009. This fascinating and must-watch documentary investigates the evolution of the English Language in an adventurous, almost biographical fashion from its arrival in Britain in the 5th century, its voyage across the Atlantic to the Americas, its influence among slaves in the Caribbean and its survival in today’s techno culture. The DVD is still available at Amazon.com. The price for the 405 minute, 4 disc series is just $69.95 here. And if you would like the companion book by Lord Bragg too, it is still to be had here with FREE DELIVERY WORLDWIDE. In the television series, Bragg – a prolific author, screenwriter and broadcaster in Britain – explains the origins and spelling of many words based on the times in which they were introduced into the growing language that would eventually become modern English. Not in a tedious, studious way but as a fun and fascinating journey tracking the development and growth of words using a very organized and easily understood approach. For those who regard English as merely a school subject, you really should look at this series as it will amaze you in the way that our words have come into being and the circumstances in which they have. Much of the production scenes are done on-site around the world, as the history of the language is tracked. 1. Birth of a Language. From the Romans quitting England, leaving behind a race of people, the Celts, to their own devices to the invasion of Germanic tribes in around 500AD Bragg examines how Anglo-Saxon, with its many forms and dialects became the basis of our English today. In this second part, Bragg looks at how Anglo Saxon evolved as the language of England while in time the peoples of the small, separate kingdoms in England became part of the new developing Christian civilization of Europe. Then came the invasion of the Norman peoples under William the Conqueror which brought further change to how language was used. Norman French became the language of the court, with Latin, acquired through the Christianization of the church in England, became the language of learning. The Anglo-Saxon tongue was subsumed to the peasant class. Then gradually English began to oust French as the language of law and government and a new found confidence in English literature developed, especially through the works of Geoffrey Chaucer. After Chaucer vowels were pronounced differently and words took on sounds more familiar to us today. 3. The Battle for the Language of the Bible. The Black Death in 1348 which killed up to a third of the population, weakened the hold of Latin among the educated and helped what is now known as Middle English to really take a hold. It was clear that this English was to be the principal language and through the efforts of theologian John Wycliffe a new English Bible was created. But it was the arrival of the printing press in the 15th Century that the various forms of English were brought to a standard in spelling and pronunciation. 4. This Earth, This Realm, This England. Repelling another planned invasion of England this time by the Spanish in 1588 England supremacy on the sea saw its language being taken to foreign lands and the trade that these mariners undertook saw new goods and words come back to England and become absorbed into what was becoming Modern English. It was from here that the Renaissance blossomed in the land with Elizabethan poetry, prose and especially drama taking centre stage through the mastery of William Shakespeare. With the aid of a native man, Squanto, the new settlers were able to establish themselves in this New World. Their background was one of Puritanism, with emphasis on the Bible and God-fearing obeisance. The New England Primer which reinforced the way that the settlers chose to live and the Blueback Speller which taught strict pronunciation principles, ensured that class distinctions emanating from wealth, speech and manner were eliminated. 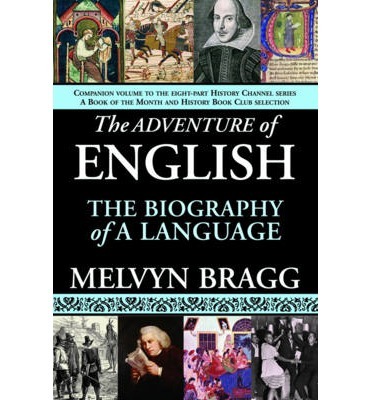 Bragg shows how English was given to the American slaves and evolved in the 18th and 19th centuries to become a form of English in its own right. Science and the Royal Society in 17th century England now takes centre stage. Academics and scholarly men now wrote their theses in English not Latin in this Age of Enlightenment. Daily newspapers appeared widely bringing news and increased literacy to a great many people. Books were produced not just for learning but also for pleasure and perhaps significantly Samuel Johnson produced his Dictionary of the English Language in 1755. Female readers were making their demands known too and female writers came to the fore with the advent of the novel. The impact of the Industrial Revolution on language is considered as industry was thrust forward as an institution in its own right. 7. The Language of Empire. British foreign trade takes the language into India and the Caribbean, while convicts take it to Australia. As a result the English language is enriched immeasurably. 8. Many Tongues Called English, One World Language. The final programme sees English establishing itself as the language of 21st Century International Commerce. It is even seen as the new language of the Internet. 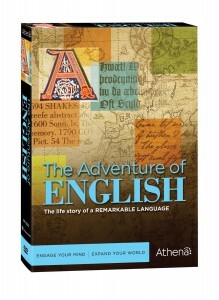 Wherever it has been taken and whatever it has encountered, the English language has adapted and met all of the challenges it has been compelled to face throughout this wonderful Adventure in English. Who will find this series of interest? So for those who wish to compare, I’m afraid there aren’t many DVDs around with which to do so, only a few VHS copies. 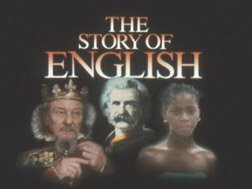 The Story of English, Robert MacNeil, 1986. VHS only. 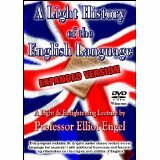 A Light History of the English Language; Prof. Elliot Engel, December 2009. A light-hearted look at the development of the English language. Run time : 46 minutes. Available here. Should you buy Melvyn Bragg’s Adventure of English? You can see all eight parts of the series on You Tube for free, but personally I would need to possess (and do have) a copy of the series to watch again and again. So, most definitely buy yourself a copy and enjoy it. If you have any questions relating to this dvd or would like to leave your own personal comments about the series, please feel free to do so below. This entry was posted in All, Reviews of Good Things and tagged Adventure of English, biography, history of words, Melvyn Bragg on March 3, 2015 by Adrian. Do You See An Enemy?